The NBC10 Newport International Polo Series, Presented by BMW is pleased to announce its partnership with Forty 1° North as an International Team Sponsor for the 25th anniversary season. The destination, ranked ‘#9 Best Hotels in the Northeast’ in Conde Nast Traveler Readers’ Choice Awards, will be Team Headquarters for the French Polo Team, as well as Official Gala Hotel for Bal du Soleil, at the pinnacle of the 2016 polo season. “Forty 1° North has been a key Sponsor of the Polo Series since 2011, and we are excited to have their participation in our biggest weekend of the summer,” adds Dan Keating, USA Captain and Founder of the Polo Series. The first weekend in August will include Newport Polo’s annual charity gala, Bal du Soleil on Friday, Aug. 5 at Rosecliff, with a pre-gala Meet and Greet at Forty 1° North for gala attendees. The following day, the Newport International Polo Series will feature USA vs. France, at 5pm, followed by an authentic New England Lobsterbake to conclude the festivities planned to celebrate the return of the French Polo Team this season. The French Polo Team, hailing from the south of France this year, debuted in the Polo Series in 1993, and made its last appearance here in 2008. The Newport International Polo Series celebrates its Silver Jubilee this season, and has planned an international lineup of teams that spans the globe. The social climax of the polo season is the annual International Polo Charity Ball which has raised hundreds of thousands of dollars for nonprofit organizations – this year, French Riviera glamour is the inspiration for Bal du Soleil, with the French Polo Team to support newportFILM. Sign up to a private & secure guest list to receive event updates by email. Newport Polo hosts the Newport International Polo Series, a popular and unique summertime tradition since 1992 that attracts audiences from throughout the New England region. Public exhibition matches are held every Saturday, June through September. Now entering its 25th season, acting as a global ambassador to the sport of polo, new teams have been invited for its jubilee. As of this season, teams from 32 countries will have taken to the field for the Newport International Polo Series, including challengers from England, Ireland, Scotland, France, Spain, Portugal, Germany, Ghana, Nigeria, South Africa, Egypt, India, New Zealand, Australia, Chile, Argentina, Costa Rica, Jamaica, Barbados, Canada, Hungary, Dominican Republic, Netherlands, Kenya, Brazil, China, Italy, Mexico, Sweden, Singapore, Monaco and Morocco. Located in the heart of historic downtown Newport with a stunning backdrop of the harbor, Forty 1° North is a waterfront destination close to Bellevue Avenue’s famous mansions, the International Tennis Hall of Fame, and just steps away from shopping, galleries and museums. 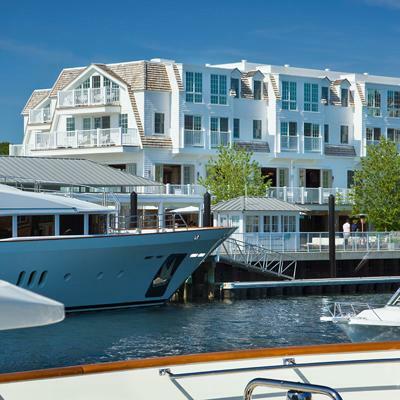 Forty 1° North offers a modern take on the marina-side luxury hotel, with a deliberately innovative and contemporary interior design to represent a new era in Newport hospitality. The boutique hotel offers full-service facilities including a state-of-the-art marina, two unique restaurants, 28 beautifully appointed lodgings, tailored corporate and event packages and extraordinary service.